Maughlin is a merchant in Majula, hailing from the distant western land of Volgen. He travels from land to land selling his wares. However, as a result of his failing business, he has drifted into depression. 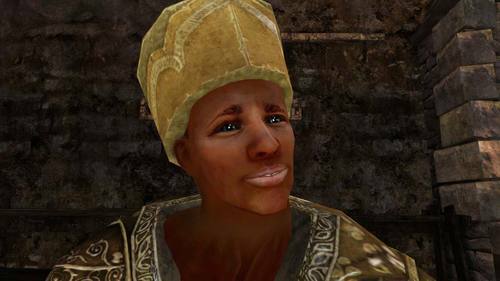 Maughlin was originally disenchanted with the desolation of Drangleic when he first arrived, but when business begins to pick up he starts to show his avarice. Maughlin explains that he was an unsuccessful merchant back at Volgen, and that it was impossible for him to get off the ground because a group calling themselves the Blue Sentinels won't allow anyone to trade without paying them first. He expresses his outrage at the Blue Sentinels, condemning their claims to be serving the greater good as "absolute hogwash". If the Player spends enough souls at Maughlin's shop he will eventually start to go hollow. He will become fixated on how much he has earned, stating that he is rich, and find it difficult to remember who the Player is. He will also become increasingly arrogant the more you spend at his shop. When aggroed, Maughlin will attack the Player with a falchion. 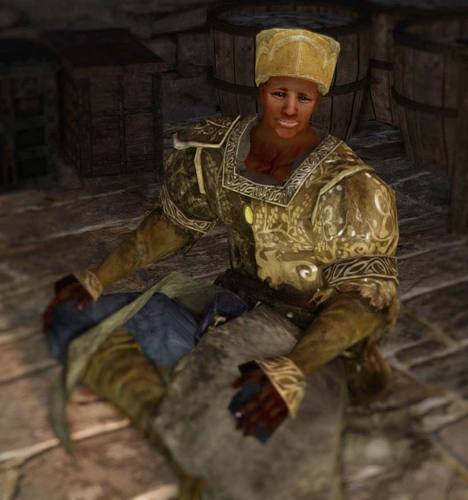 A somewhat timid shopkeeper at first looking to strike it rich in the rough land of Drangleic, Maughlin is a merchant who offers basic armors to the player early in the game. However, the player's desire for better, more reliable equipment only transforms our timid shopkeep into a self-confident and somewhat arrogant success story of man. However, in time we see that as Maughlin begins to build upon his wealth, his memory of home begins to fade. Perhaps poor Maughlin is experiencing the first few stages of hollowing? It's interesting how Maughlin starts to forget once he becames succesful. Maybe he never actually wanted to be a shopkeeper, but maybe he inherited the business unwillingly? His shy personality is very unfitting for someone who's gonna sell stuff that'll save lives in combat. He might get his fleeting happiness from the riches, but he'll still hollow because he's bound to his job and will never pursue his dreams. W-welcome, to my shop. I-I'm Maughlin, and I sell armour. Oh, sorry, I… Please, do have a look at my wares. Oh, hello again. I-I hope you find something of use. Well, thank you, for coming back! Do take a look at my wares. Oh, I was hoping that you would come. I've stocked some new things, and I thought you might be interested. They've been selling rather well, and I may step up operations soon. I'm…well I'm surprising even myself, to be honest. I'm glad to see you safe. Take…take a look at my wares. Forget to buy something? Go ahead, take your time. Um, sorry, have we met? Oh sorry, it's just I've been awfully busy lately. Care to look over my wares? Please, be my guest. Looking for armour? Everything I offer is quite dependable. You need armour? Go ahead, see what I'm offering. In a spot of bother are we? Here, take this. My compliments. I came from the west, from Volgen. Have you been there? It's a lively place, vibrant with trade. Very competitive, of course. And y-you have to grease the wheels to get anywhere. But I didn't have the funding for that, so I left home in hopes of striking gold. A group calling themselves the Blue Sentinels have gained much power in Volgen. You can't even run a shop without their blessing. They claim to be working for the greater good, oh…but it's absolute hogwash. Oh, by the gods…Why the hell am I here? Did I mention before that I'm not from these parts? The desolation here was disenchanting at first. But over time, things started to turn my way. Yeah, I-I've got a good few regulars now. They're all strangely desperate, and quite willing to pay a premium. Sadly, some of them never come back. But I try not to think about it. Have you seen that warrior lugging that giant blue sword about? I'm no expert, but that appears to be a fine specimen. The monstrous thing has a peculiar design, quite unlike anything found in Volgen. If you should speak to him, would you ask him if he won't sell it? I'd have to take another look, but I'm confident I could offer quite a price. I considered returning to my homeland, but I've decided to stay a while longer. I've started to turn a handsome profit now, and I can't bear to give it up. Heh. I'm rich, I'm rich…Mwa hah hah! I don't need to go home anymore! That sword that you've got… May I, um, have a look at it? Oh, no, I'm afrai…sorry, I'm afraid this is a fake. It's not worth much at all. The original must be somewhere, I would imagine. Thanks very much. And, do please come again. Thanks very much. Do come again! Thanks for the purchase. Do come again. Well, I, I do hope I see you again. Are you sure? Well…I may sell out while you're away. Robe worn by settlers of Tseldora. Rather fancy but with low defense and unfit for battle. Its design recalls Tseldora's glory days, the peak of the brightstone boom.